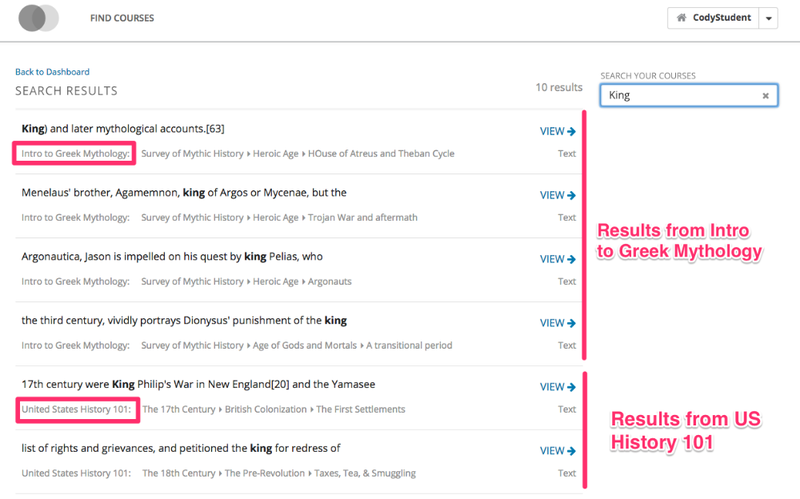 Within Open edX students can search for courses or for specific content within the courses they are taking. It's easy, and here's how it works! Course Discovery enables the ability to search an entire organization's course catalogue for specific course keywords. Course Discovery also comes equipped with a few default search facets that allow students to narrow their search by things like Organization, Course Type, or Language, so as a course creator you'll want to make sure those parameters are consistent across similar courses. Dashboard Search enables students to search for content across all the courses in which they are currently enrolled. All a student needs to do is type the search terms in and hit Return on the keyboard. 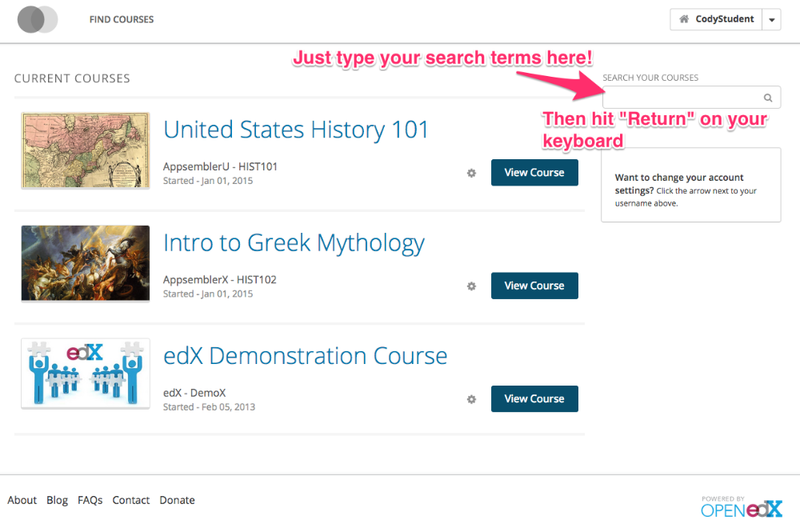 Open edX automatically searches through all your courses and sorts search results by course and type of content. Here's an example of the different types of search results that are returned. If your videos have subtitles enabled (which we highly recommend), the search feature will even look for your terms in the videos! Courseware Search allows a student to search for content only within a specific course. In this example, because I'm in this US History class courseware, I'm only going to get search results from the US History content. Courseware search functions in basically the same way that Dashboard Search does, except for the fact that it only looks for content within a single course - whichever course the student is currently in and working with. So Dashboard Search is also looking for things like Section/Subsection titles, text content, and subtitles/transcriptions of videos. So what are some things that don't show up in Dashboard or Courseware Search? Staff Only content - any content that's hidden from students will also be hidden from search results. Why isn't my content showing up when I search for it? If your content is published and live to students, but still isn't showing up when you search for it, the most common problem is that the course needs to be reindexed. It's good to get into the habit of reindexing your course every time you add or modify course content. Thankfully, it's a very easy process that simply involves the click of a single button in Studio. Check out this article for more information.